There are a variety of ways to make your home more energy-efficient and more comfortable throughout the year. Window treatments are a great place to start when you are looking to insulate your home in Feasterville, Pennsylvania. Windows are accountable for up to fifty percent of your heating and cooling energy being lost. This is a total waste of energy. However, we are here to provide you with some solutions to this waste of energy in the form of three different window treatment options. Stop by Blind Builders today to learn more about window treatments that can insulate homes in Feasterville, PA.
First, we have Duette® Honeycomb Shades. This is the original cellular shade. The Duette® shade is unique in its cellular structure. These cells trap air and, as a result, insulate your home, keeping it comfortable whether it is during a cold winter or a hot summer. These shades are available in a variety of cell sizes, as well as many other customization options. 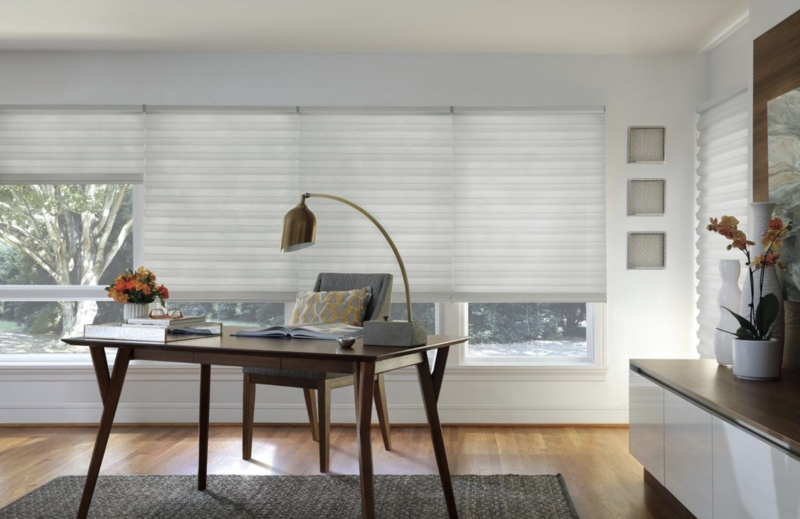 Next, you can choose the Sonnette™ Cellular Roller Shade. This shade combines a traditional cellular shade with a roller shading, creating a simple, yet energy-efficient result. The rounded shape of these cells creates a very clean and stylish aesthetic, while filtering light into your space in a beautiful and unique way. These shades are great for giving your space a unique personality due to the way they reflect light. You also have the option of choosing a room-darkening fabric instead of light-filtering sheer fabric, which would give you much more light control. Lastly, we offer the Solera® Soft Shades. Another unique combination of traditional-style shades, the Solera® Shades combine a cellular shade with the timeless style of a roman shade. This model is great because it features internal lift cords, making it a safe window treatment for children and pets. You will never have to worry about your family’s safety being at risk. No matter which of these styles sound preferable to you, we will do our best to help you customize them to fit the needs of both you and your family. Whether that just means helping you choose between a sheer fabric or an opaque fabric or it means choosing everything from a specific texture and opacity to a specific operating system, we are here to make sure your window treatments are perfectly suited to your needs. Blind Builders, Inc offers a wide variety of beautiful window treatments that can insulate homes and meet other needs. From stylish blinds to stunning shades, we have something to fit everyone’s needs. Our showroom, here in Feasterville, Pennsylvania, offers full-size displays of a variety of these window treatments. These displays are available for you to browse, touch, and even operate in order to ensure that you find exactly which options work best to fit your needs. You can also count on our incredible staff of experienced designers to be there to help you, offering advice and answering any questions you may have. If you are looking for new custom window treatments in Bucks County and Montgomery County, including Newtown, Yardley, Doylestown, and Warrington, Pennsylvania, contact us today or stop by our showroom! We would love to help you get started designing your perfect window treatments.